Darksiders, Red Faction, and Titan Quest could get sequels from the publisher behind Painkiller: Hell and Damnation. Looking back, it's stunning to count how many intellectual properties THQ once controlled. The former publisher had its fingers in many pots, owning the rights to franchises like Homeworld, Saints Row, Darksiders, and many more. The company's variety made its bankruptcy all the more disappointing, but at least many THQ properties are making their way to new homes. Fresh on the heels of Gearbox's Homeworld acquisition, Nordic Games revealed that it's secured a rather significant portion of THQ's catalog. 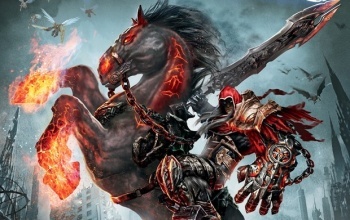 The Painkiller HD and Book of Unwritten Tales publisher now holds the rights to Darksiders, Red Faction, Titan Quest, and several other recognizable franchises. "In the long term, we either want to cooperate with the original creators or best possible developers in order to work on sequels or additional content for these titles," said Nordic Games CEO Lars Wingefors. "A very important point for us is not to dash into several self-financed multi-million dollar projects right away, but rather to continue our in-depth analysis of all titles and carefully selecting different financing models for developing new instalments of acquired IPs." Not only is this big news about THQ's former properties, but it's a huge step forward for Nordic Games. The THQ auction officially marks the biggest acquisition in Nordic's history, who spent approximately $4.9 million to obtain 150 stock-keeping units. The transaction includes all the above-mentioned franchises, Destroy all Humans, MX vs. ATV, Supreme Commander, Marvel Super Hero Squad, and more. Even licensing for Wheel of Fortune games are now held by Nordic. For comparison, Gearbox's winning bid for Homeworld alone cost $1.35 million. All transactions between Nordic Games and THQ will be brought before the US Bankruptcy Court on May 13, at which point the transfer should become official. We still shouldn't expect a new Titan Quest or Red Faction game for some time, but the prospect of original creators returning to these franchises should be promising to a great many fans.